Preheat the oven to 220°C/gas mark 7. Heat 1 tablespoon of the oil in a small frying pan and gently fry the shallots until soft. Meanwhile, prepare the other ingredients. Brush a baking dish with the remaining olive oil. Scatter the shallots over its base, then lightly season the fish and arrange in a single layer in the dish. Scatter with the tarragon, sliced cherry tomatoes and capers. Beat the crème fraîche to make it more liquid and spoon evenly all over the top. 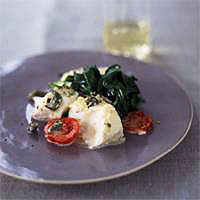 Sprinkle over the cheese and bake for 15-20 minutes or until the fish is cooked and the dish is sizzling golden-brown. This recipe was first published in Mon Jan 01 00:00:00 GMT 2001.